When kids start to hunt, usually the first things they'll go after are chipmunks and gophers. That leads them to the smallish red squirrels, ubiquitous gray squirrels, and the highly prized and relatively rare fox squirrels. Hunting squirrels is not only a lot of fun, but they make excellent eating. Believe it not, for their size, squirrels are quite meaty, with tender meat and really do taste somewhat like chicken. 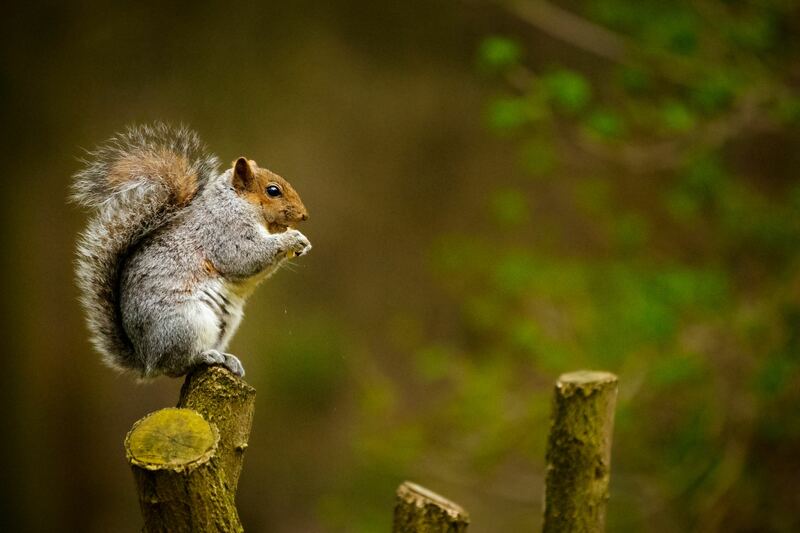 The most widely hunted squirrels are the grays. The most popular hunting rifle for squirrels right now is the light and easy shooting .22. You don't need anything more. Having said that, more and more hunters are beginning to use an air rifle. The new ones fire pellets that go 1,000 feet per second or more, and they're "silent." That means if you find more than one squirrel, the crack of even a .22 will send the others scurrying. With one of these new model air rifles, you can get all of them without a sound. A good way to find squirrels is to be up and about in early morning. Find yourself a nice acorn ridge. Set up at the base of a tree and sit motionless. As the day progresses, the squirrels come out, but don't shoot the first one, as you'll scare the rest in the area off. Give it some time, and let the squirrels star milling around. You'll be able to get a number of them, if you're silent. Of course, using an air rifle won't hurt either. Shoot at the squirrel furthest away, and even if the others in the area take off, they will climb a tree and sit. Then you pick them off like a sniper. Another way to hunt squirrels is to get out early in the morning and sachet your way in the brush and woods along an oak ridge, or edge of a cornfield. Indeed, if you're able to find a location that has big elm trees, next to a cornfield, that is primo hunting grounds. The squirrels live in these trees and go to the cornfields to feed. You just stick around and the squirrels will definitely be available in this type of area. Some guides train dogs to run squirrels. Sounds crazy, but it works. If you're using a trained dog, that dog will get on a squirrel's trail and run 'em, until they climb up a tree. 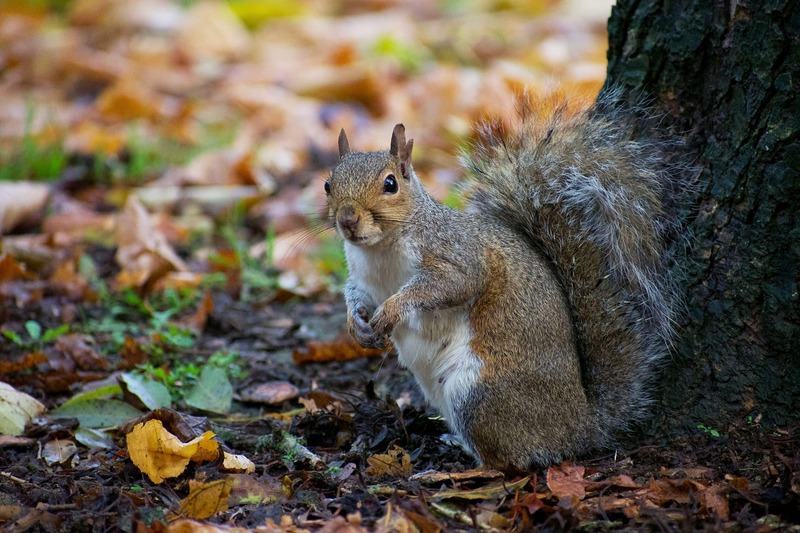 Contrary to popular belief, 90% of a squirrel's day is spent on the ground looking for food. They climb a tree for safety. When you walk through the woods, a squirrel will sense your presence, and they'll just start to run away from you. They're not going to tree, unless you're real close, or they get really alarmed. Walk quietly, and if you surprise them, they’ll tree immediately rather than running off. But squirrels are real tricky. When they do tree, they line up on a branch parallel to the ground, with their belly tight to the branch. It's real tough to spot them. Let's say you get to the base of the tree and start circling to try and find where the squirrel is located. When you circle, they'll circle, so they always end up on the other side of the tree that you're at. But I've got a great "old timers" trick for you. You stand on one side of the tree, and of course the squirrel will circle to the other side. Just throw a large branch or big rock to the other side of the tree. The squirrel will believe there's something on the other side from you, and then it shimmies around the tree trunk directly to your side to escape the perceived danger. Squirrel hunting is an easy, fun sport. It's not expensive or complex. It makes for a wonderful day in the woods, and squirrel makes a great, tasty meal. Just ask Daniel Boone!